In a talk given last year by professor of organization behaviour at London Business School Nigel Nicholson, the visionary aspect of a leader is defined as by his or her ability to see things the rest of the team members do not. Successful leaders use their ability to see what others do not see to frame their actions and build a successful business. and the movie industry with Pixar. 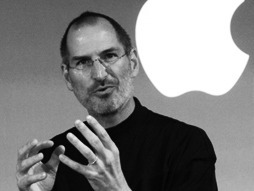 "Apple was supposed to become a wonderful consumer products company. This was a lunatic plan. High-tech could not be designed and sold as a consumer product." Sometimes, the irony of life is truly delicious. So vision is important provided he or she is looking at the right things. Again, I refer to Nigel Nicholson, and in particular his latest book, The ‘I’ of Leadership. The insight that really resonated with me was critical leader relationships (CLRs). Nicholson argues that these are the people who help leaders with their most difficult decisions. In organizations they can be upward, downward and lateral, but Nicholson argues that perhaps the most useful are external, be it a spouse, personal coach or adviser.